"Luke, when gone am I… the last of the Jedi will you be. Luke, the Force runs strong in your family. Pass on what you have learned, Luke…"
Since 2012, Star Wars™: The Card Game has entertained fans with its unique deck-building challenges, thrilling edge battles, and changing tones ranging from drama to comedy. Now the game's production has come to a close, and though we know players will continue to enjoy the way the LCG® interprets the Galactic Civil War for many years to come, Fantasy Flight Games Organized Play will soon arrive at its completion, as well. We will be saying farewell at our final competitive events—the European Championships and the North American Championships, held at the UK Games Expo and Gen Con Indy, respectively. Organized Play has been an integral part of Star Wars: The Card Game from its beginning. The game was first presented to the attendees of the 2012 World Championships. We have seen six World Championships, one European Championship, and two North American Championships—all of which crowned champions who have had their legacies fused with that of the game itself. 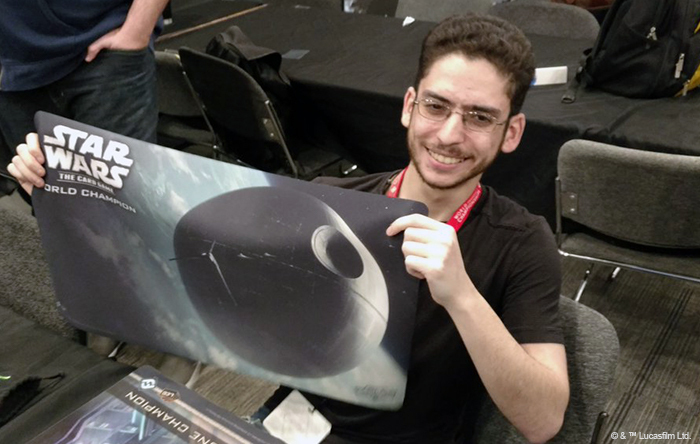 Javier Maldonado with his 2018 Star Wars: The Card Game World Champion playmat. As with all of our competitive LCGs, Star Wars: The Card Game—at its apex—has featured The Greatest Prize in Gaming: the chance to inspire the design of a card. Some of these cards have already appeared in the game. Several other cards, however, were designed only after the game's conclusion had been announced. 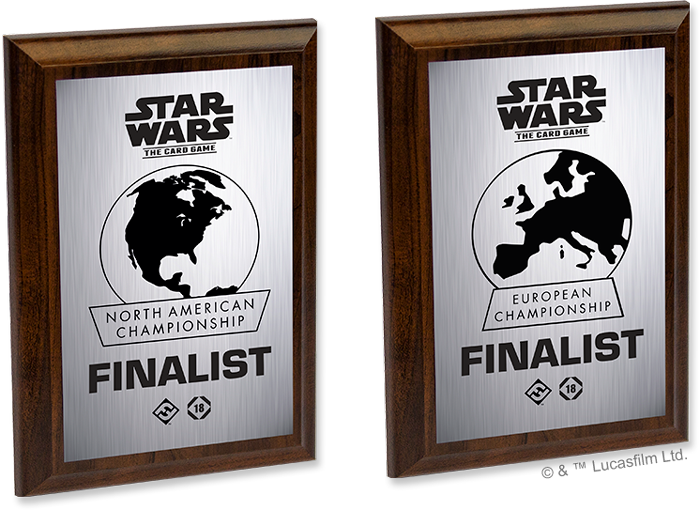 These cards were awarded to attendees at the 2018 Star Wars: The Card Game World Championships—and they will be awarded to each participant of the 2018 European and North American Championships! All of these cards feature the new Replacement keyword, which alters the normal deckbuilding rules to allow these cards to be included in a deck without being part of an objective set. You simply remove a card with the same sequential number from another objective set and replace it with this new card. In this way, these cards open an astonishing range of deckbuilding options that you and your friends can pursue in casual games. Each attendee at the 2018 European and North American Championships will receive a complete playset of the completed cards—sharing in the legacies of the champions who created them and continuing the legacy of the game itself. None of these cards will be legal for those tournaments or other official Organized Play events. A downloadable PDF of these cards will be made available online later this year. The champion cards are one of our ways of saying thanks to the community and the champions who have made this game great, but they're not the only prizes you'll receive at the 2018 European or North American Championships. In fact, they're not even the only participation prize. 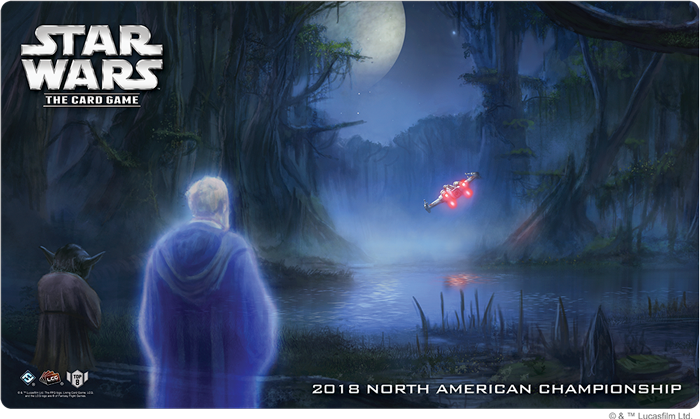 In addition to the complete set of champion cards, each participant at the 2018 European and North American Championships will receive an extended art copy of the complete May the Force Be With You objective set. 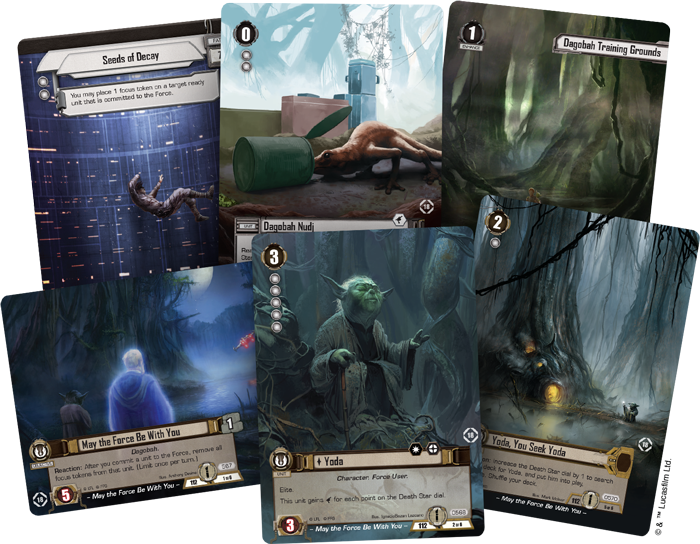 That means you'll get full-bleed art on each card in the popular Jedi set: May the Force Be With You; Yoda; Dagobah Nudj; Dagobah Training Grounds; Yoda, You Seek Yoda; and Seeds of Decay. If your deck has this objective set, you'll be able to swap in the cards right away. You'll feel like you've been to Dagobah, completed your training, and are now ready to confront Darth Vader! Everyone who makes the cut for Day 2 will find Yoda making yet another appearance. The wizened Jedi Master features on the light side of a double-sided plastic Force card. Emperor Palpatine menaces your opponent from atop the card's dark side face. Each player who qualifies for Day 2 at either the 2018 European or North American Championships will receive three copies of this double-sided plastic Force card. Play your way into the Top 64 at the Star Wars: The Card Game 2018 European or North American Championships, and you'll receive another prize designed to make your continued play more enjoyable—a complete set of acrylic tokens. For making the Top 64, you'll receive twenty tokens—six each of the game's focus token and shield token, as well as five one-damage tokens and three three-damage tokens. All of these come on a stylish mirrored silver background. Make the Top 32, and you'll receive a commemorative binder to that will stand testament to your performance even as it helps you sort and store all the prize cards you've already received. 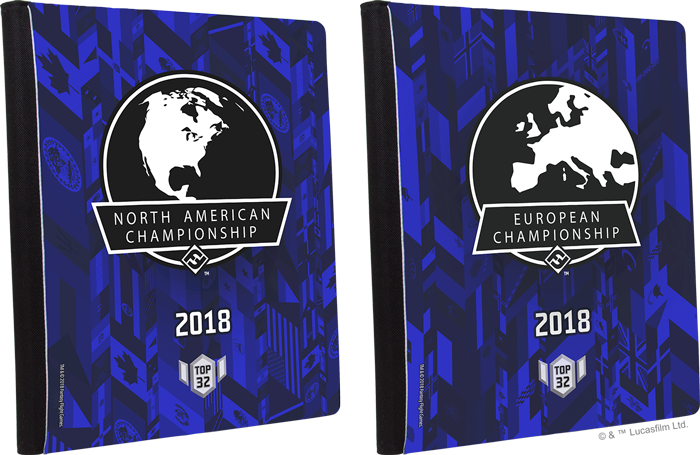 Proudly displaying either the European Championship or North American Championship atop a blue background layered with the appropriate flags, this binder holds nine standard-sized cards per page and up to 360 cards total. An elastic fastener wraps over the back to keep it shut securely. 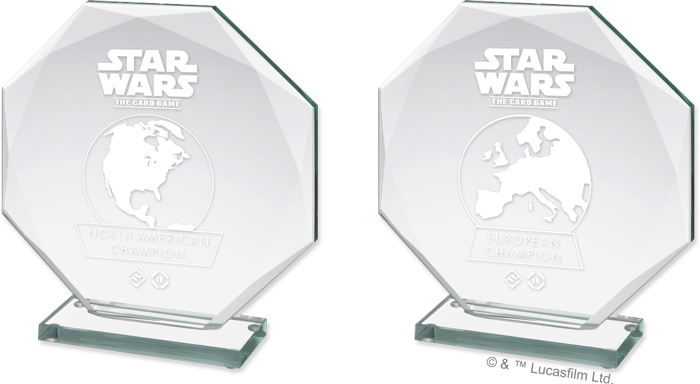 The Top 16 participants at the Star Wars: The Card Game European Championship and North American Championship will receive a medal bearing the event's logo. Reach the Top 8, and you'll receive a playmat that ensures the Force will be with you—always. 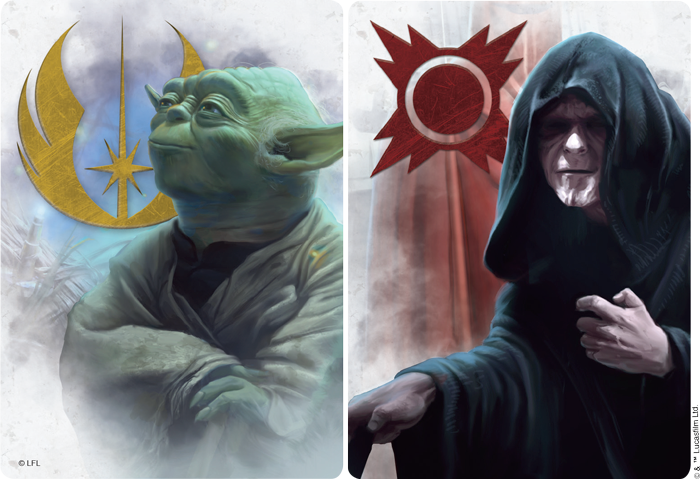 Emblazoned with the name of your event—either the 2018 European Championships or 2018 North American Championships—this playmat offers a fantastic look at the art from the May the Force Be With You objective and tops it off with a symbol that proudly displays your placement at the event, whether that's the Top 8, Top 4, 2nd place, or 1st place. Given how challenging it will be to emerge victorious from all the battles of the European and North American Championships, there can be little doubt that the Top 4 players will all be strong with the Force—and as the Force binds all things together, we'll hope to see them all competing for the top honors at the 2019 World Championships for one of our other Star Wars games! For their efforts, each of these players will earn a free event ticket for the 2019 Star Wars World Championship tournament of their choice. The Runners-Up at the European and North American Championships each also earn a commemorative plaque in addition to their free event entry. "You can’t win, Darth. If you strike me down I shall become more powerful than you can possibly imagine." The greatest of Jedi never fully leave the Star Wars galaxy. They become one with the Force! 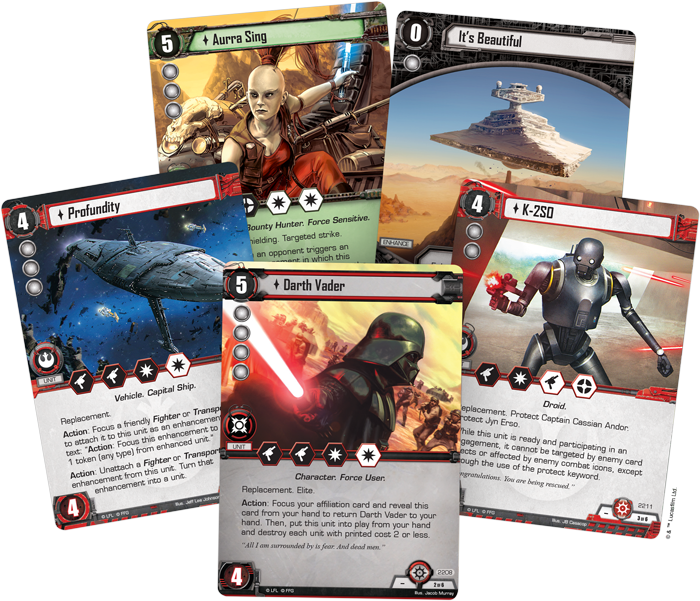 Accordingly, the winners of the Star Wars: The Card Game European and North American Championships will each find themselves able to manifest in another of our Star Wars games. 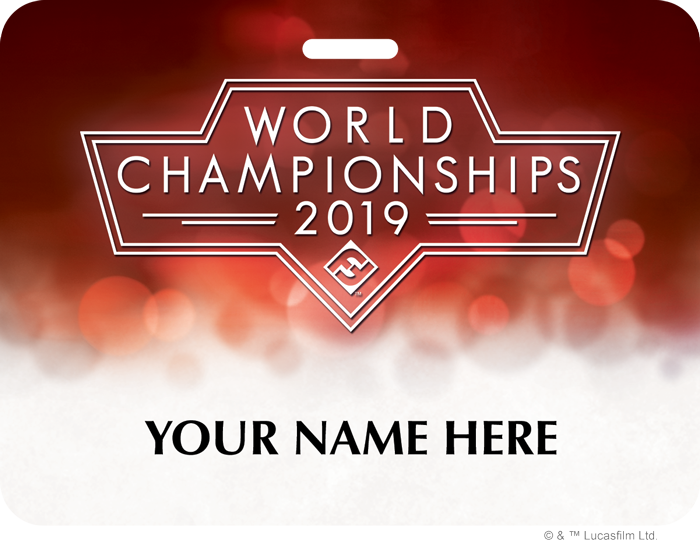 Capping off all the other prizes they've won over the course of the weekend, the European Champion and North American Champion each win a flight and lodging for the 2019 World Championship tournament for another Fantasy Flight Games Star Wars game of his or her choice. We look forward to seeing these champions wielding the Force in their new settings! The European Champion and North American Champion also win a reserved seat and free event entry for one guest each. 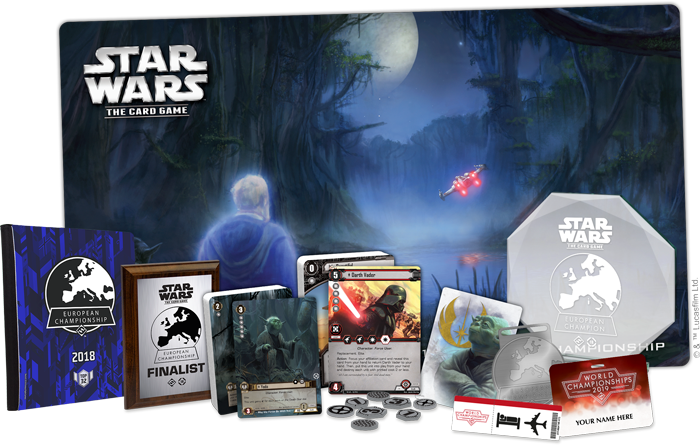 The 2018 European Championship and 2018 North American Championship will be the final showcase events for Star Wars: The Card Game and its Organized Play. After these events, the Organized Play team will take its leave, and you will be the last of the Jedi. It will be up to you to pass on what you have learned. Thank you for all the support you've shown the game over the years. The Force will be with you… always!